In 2009 Scott Sumner wrote an article – The Real Problem was Nominal – in which he explained – was later became known as the Market Monetarist explanation for the causes of Great Recession. The Market Monetarist explanation for the Great Recession is that the Federal Reserve (and other central banks around the world) allowed monetary conditions to become far too tight in 2008 and that the crisis was not caused by a banking crisis, but rather that the banking crisis was a consequence of the extreme tightening of monetary conditions during particularly the summer of 2008. Hence, the Fed and other central banks gravely misdiagnosed the problem and as a consequence applied the wrong medicine for the problem. Furthermore, by focusing on nominal interest rates central bankers were led to believe that monetary conditions were very easy, while they in fact monetary policy became extremely tight during the second half of 2008. This explanation for the crisis is not yet commonly accepted but more and more economists now acknowledge that particularly the Federal Reserve failed greatly in 2008 as it failed to response appropriately to the spike in dollar demand. Unfortunately, I fear that the Federal Reserve today are in the midst of repeating the mistakes of 2008. Hence, the Fed continues to argue that monetary conditions are very accommodative, while in fact monetary policy has become increasingly tight over the past two years and particularly in recent months we have seen a significantly tightening of US (and global) monetary conditions. Real interest rates soared much higher. Inflation expectations fell sharply, and by October were negative. Beginning in August, industrial production plunged. The dollar soared in value against the euro. This is the core Market Monetarist story. We believe that markets are the best indicators of the “tightness” of monetary conditions. If for example market-inflation expectations drop, the dollar strengthens and commodity prices fall at the same time then it is a very strong indication that money demand growth exceeds money supply growth and hence that US monetary conditions are getting tighter. This also means that monetary policy works with long and variable leads (rather than lags) – the policy changes starts to impact the economy once the they are announced rather when they are “implemented”. So lets look at what these indicators have been telling us recently. First lets look at real interest rates – here we look at real 5-year US bonds (nominal bond yields minus 5-year TIPS breakeven inflation expectations). 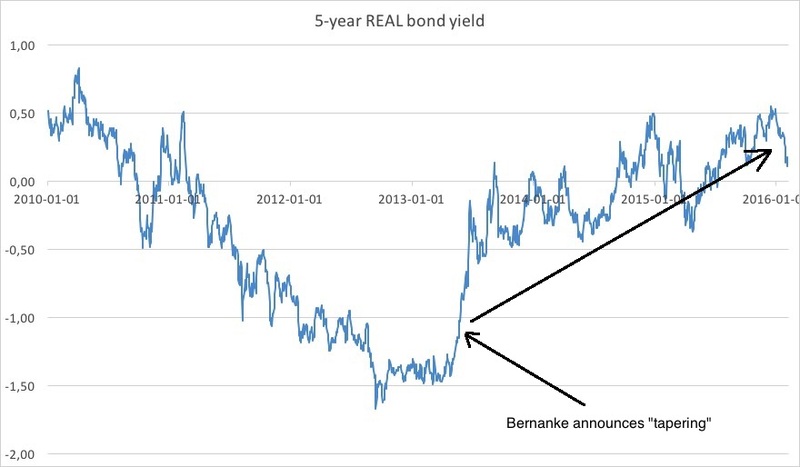 Looking at real bond yields we get an clear indication that monetary conditions have been tightening since May 2013 when then Fed Chairman Ben Bernanke announce the Fed would “taper” it monthly asset purchases and gradually scale back quantitative easing. Hence, it is also clear that the Fed didn’t initiate the rate hiking cycle in December 2015 as we are normally told, but rather in May 2013 if we focus on real rather than nominal interest rates as every textbook would tell would be the thing to do. I am not arguing here that it was a wrong decision to start tapering in 2013, but rather that we need to get the facts right – the Fed has been tightening monetary conditions for more than two year – at least if we focus on real interest rates. As the graph shows Ben Bernanke’s Fed had essentially managed to anchor inflation expectations around 2% before tapering was initiated. However, that has dramatically changed since then and inflation expectations has consistently been drifting downwards for more than two year with out the Fed taking any corrective actions to halt the decline in inflation expectations – effectively telling the markets (and everybody else) that the Fed really isn’t that concerned about hitting its 2% inflation target. That message has further been strengthened after Janet Yellen took over as Fed chair in February 2014. Yellen has again and again told the markets that she really don’t trust market expectations and that inflation would soon rise. 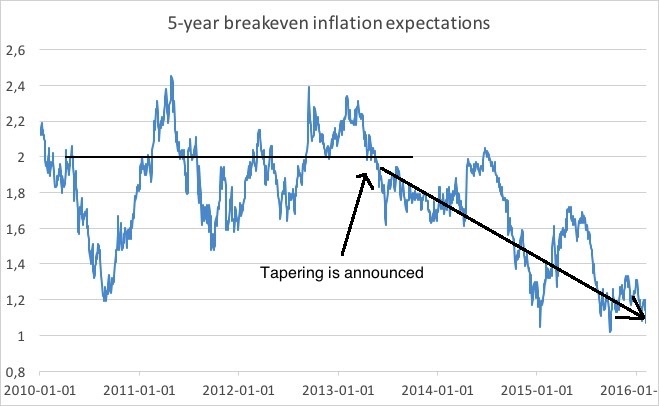 She, however, has been badly wrong and 5-year breakeven inflation expectations have now dropped to 1%. If we look at the stock market the story is slightly different than when we look real bond yields and inflation expectations. Hence, S&P500 continued to inch gradually up essentially until a year ago when stock prices started to flatline and after Yellen in October pre-announced the December rate hike stocks have essentially fallen of a cliff. A way to interpret the stock market action is that even though monetary conditions were becoming tighter after May 2013 monetary continues weren’t getting excessively tight before sometime during 2015. This was essentially also the story that I was telling in 2014 and early 2015 – most indications were that nominal GDP was growing along the post-2009 4% path, which I at that time considered to be Fed’s de facto monetary policy target. See for example this post from March 2015 where I agued that monetary policy more or less was on track. At that time there was no real signs that the post-2009 recovery in the stock market was about to come to an end. However, that changed shortly thereafter and I personally became quite worried about what I considered to be an overly hawkish Fed in August last year. A concern I voiced in a number of blog posts in August. See for example here and here. I was particularly concerned that Yellen apparently ignored both what the markets and nominal indicators (M, V, P, NGDP) were telling us about monetary conditions. Hence, in August it was becoming clear that nominal GDP was falling below its post-2009 4% path and that inflation and inflation expectations consistently were undershooting the Fed’s 2% inflation target and despite of that Yellen continued to argue that we would get a rate hike in September. The Fed then postponed that rate hike after the first round of market jitters and the stock market sell-off in the late Summer of 2015, however, it was clear that the Fed desperately wanted to “normalize” interest rates (whatever that is!) and the Fed then in October pre-announce the December hike. Ever since then financial market distress has increased. 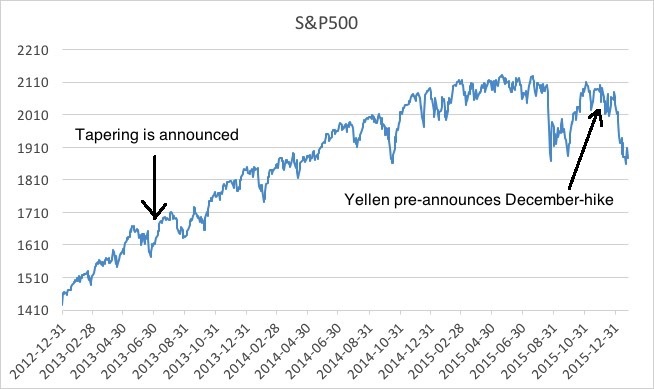 Here the story is the same as from the stock market – it might be that the Fed initiated tightening in May 2013, but did it was not before the Summer of 2014 that oil prices started to drop. 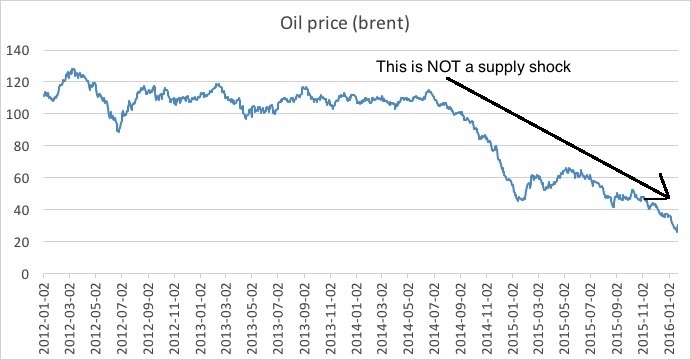 There are many theories (and conspiracy theories) about why the oil price have dropped and it often argued that the drop in oil prices is driven by the supply side – more oil being put on the market by the Saudis. However, if that was indeed the case one should have expected global stock markets to have rallied and we should have seen a pick up in growth. That, however, has certainly no been the case, which makes me think that the drop in oil prices mostly is about global monetary conditions becoming increasing and excessively tight. This is the combined effect of both the Fed and the PBoC tightening monetary conditions at the same time. So that is yet another market indicator that strongly suggests that US monetary conditions have become increasingly tight – too tight – for some time. The final market indicator to look at is the dollar. Once again the story is the same – there is some effect of the ending of quantitative easing and the dollar trended moderately stronger indicating a gradual, but not dramatic, tightening of monetary conditions. 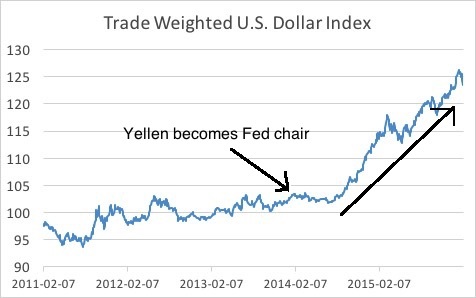 However, shortly after Janet Yellen became Fed chair in February 2014 the dollar started to appreciate strongly and that has been going on for two years more or less uninterrupted. Hence, looking at real bond yields, inflation expectations, the stock market, commodity prices and the dollar the message is uniform – monetary conditions have gradually become tighter over the past 2-3 years. Initially the tightening of monetary conditions were likely not excessive, but the signs are now very clear that since August-October 2015 the Federal Reserve got way away ahead of the curve and it is now very clear that the markets are telling us that monetary conditions in the US are become far too tight and it is only a matter of time before this will be very visible in the macroeconomic data. In fact it is already visible. 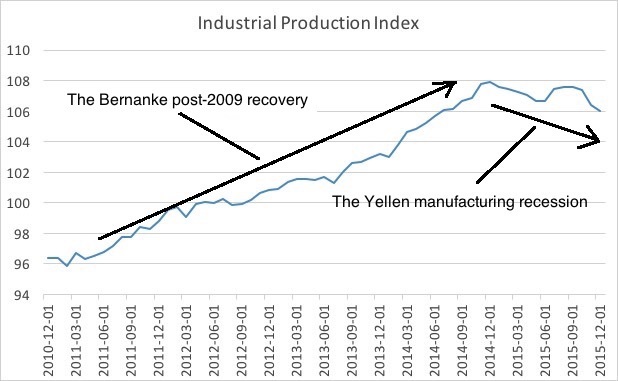 Just take a look at the final indicator that Scott highlighted in his 2009-article – industrial production. Again the picture is very clear – the post-2009 recovery in the US manufacturing sector was doing fine until mid-2014 whereafter we have seen a clear downward trend in industrial production. It is hard not to conclude that this is a direct consequence of the tightening of US monetary conditions over the last couple of years. The question is of course whether this will turn into an economy-wide recession or not, but if we compare the recent developments with the situation in 2007-9 then we certainly should be worried. In this 2009-article Scott Sumner argued that a key contributing factor the mistakes of the Fed in 2009 was the that Fed simply misdiagnosed the crisis. Hence, while Scott clearly showed that the crisis was caused by an excessive tightening of monetary conditions, which in turn led to a banking crisis the Fed on the other was convinced that the banking crisis was the cause rather than the consequence of the crisis. Furthermore, all through 2008 the Fed continued to argued that monetary conditions were highly accommodative, while in fact if you where tracking market indicators then it was clear that monetary policy had become insanely tight. I fear that the Fed today is making the same mistake once again. The Fed is convinced that monetary policy is very easing (nominal interest rates are very low), but the fact is that market indicators – as I have shown above – clearly are telling us that US monetary policy not only has become gradually tighter since the announcement of tapering in May 2013, but also that monetary policy has become excessive tight since the Autumn of 2015 and that Janet Yellen and her colleagues in the FOMC has been overly focused on labour market conditions and have completely ignored market and money indicators and as a consequence the US manufacturing sector is already in recession and it increasingly seems like that we soon will see an outright recession in the US economy and if the Fed continues to ignore that message from the markets then we might risk this turning into a banking crisis once again. And without commenting too much on the state of Deutsche Bank it is obvious that commentators and central bankers alike once again are becoming overly focused on the banking sector rather than on focusing on monetary conditions and most alarmingly all the major central banks of the world presently seem to be ruling out stepping up quantitative easing and instead continue to focus on short-term nominal interest rates. Central bankers misdiagnosed the problem, they were not able to come up with an effective policy response. It was as if a doctor prescribed medicine for a common cold to someone whose illness had progressed to pneumonia. And because economists were confused by the nature of the problem, it appeared as if modern macro offered no solutions. Thus policymakers turned in desperation to old-fashioned Keynesian fiscal stimulus, an idea that had been almost totally discredited by the 1980s. I so hope that the Fed has learned a lesson from 2008, but I fear the worst. PS if you wonder what I think the Fed should do then you should read this recent blog post of mine. 1) It seems to me that you are conflating two different notions, monetary policy and monetary conditions. The Federal Reserve Bank (FRB), indeed any central bank, can establish a very accommodative monetary policy but monetary conditions can still be very tight. This was certainly the situation in 2008. The FRB’s policy in 2008 was certainly not tight, the Target and Effective Federal Funds Rate was falling and very low, 0.38% by November. The Discount Window was extremely active offering huge amounts of money at very low rates , effectively zero in October of 2008 while lending a staggering 404 BUSD. However the actual market conditions were as you correctly note, very tight. Money was not moving . Money and reserves was available to be lent but banks and others were afraid to actually lend it. They were afraid to lend the money for fear that they would not be repaid. The tightness in the market was not a result of FRB policy but in spite of it. The simple fact of the matter is that the FRB does not control the credit market. 2) There was nothing special about the Crash of 2008 or the subsequent Great Recession. They were just another turn on the Business Cycle that has been turning for over 200 years. Aggregate demand increases, supply is inadequate so prices rise, businesses create capital so as to expand supply and capture unrealized profits, aggregate supply equals aggregate demand, the supply of money and credit expands, prices level off, capital formation levels off, the supply of goods, money, and credit exceed demand, prices begin to fall, and the economy begins to contract. As income declines credit cannot be supported and there is a financial / banking crisis. It was the same in 1873, 1929, and 2008. Central banks, including the FRB cannot stop the Business Cycle, no can. As a result the periodic collapse of capital formation necessarily produces a contraction in the availability of credit and the credit market tightens. The FRB cannot stop that either. What they can do, and did in fact, is minimize the damage that the Business Cycle causes to banks and other businesses. In this case, it was the Housing Industry that drove the growth phase of the 2001 – 2009 cycle. When the Housing Market collapsed, the financial and credit markets that grew to support the Housing Market also collapsed. The issuance of Adjustable Rate Mortgages, Interest Only Loans, Sub-Prime Loans, mortgage-backed securities (MBS), collateralized debt obligations (CDOs), amplified the effects of the Housing Market collapse of course. The Crash of 2008 was caused by the normal Business Cycle being amplified by very narrow but powerful growth (i.e. a bubble) and dubious financial activities. 3) The FRB did not “mis”-diagnose the situation in the credit market, they were powerless fix the underlying problem, i.e. the proper medicine did not exist. The FRB could not fix the financial problems of General Electric (GE)  which was facing a vast solvency crisis because they were not caused by monetary policy. Banks would not lend GE money because they feared that GE would become bankrupt and they would lose their money. They feared GE would become bankrupt because of the collapse of the Housing Market. The FRB could not rescue the Housing Market. The FRB did not provide the wrong medicine, the right medicine did not exist. The Democrat nominee for President is doomed to lose the general election, if history is any guide. Exactly! I have had that view for a long time – that if Fed causes a 2016 recession the Democrats will lose the WH…imagine Yellen made Trump president…insane. Good post. I agree, the Fed Made Trump President (well, plus decades of scaremongering about “national security,” lots of GOP plutocratic worshiping, and the weak field of both parties).